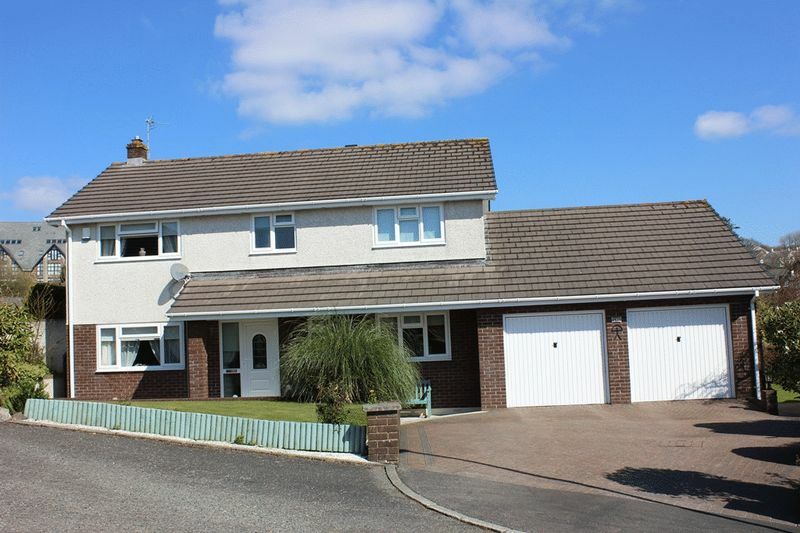 This is a beautifully presented four/five bedroom family house with double garage, parking and delightful gardens, located in an exclusive cul-de-sac of just four properties, recently updated with new kitchen, bathroom and ensuite. 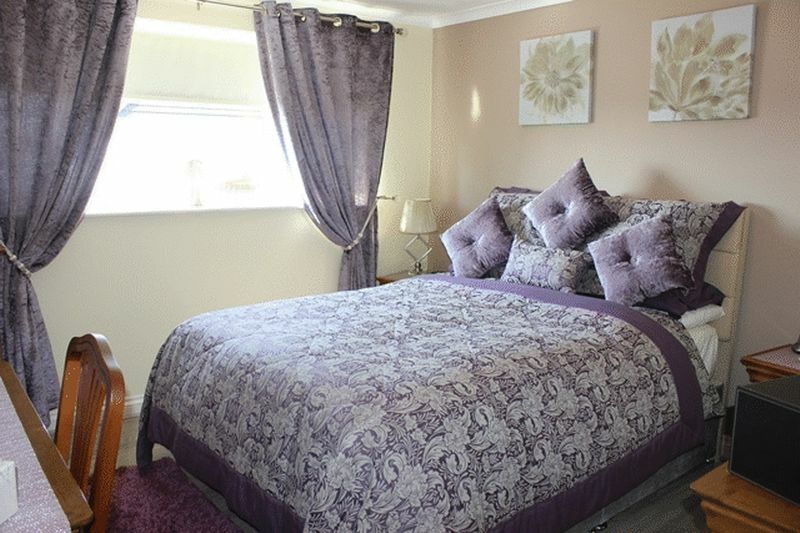 The accommodation in brief comprises of entrance hall with w.c. and galleried landing, lounge, dining room, study/fifth bedroom, contemporary fitted kitchen, breakfast area, utility room and conservatory to the ground floor. 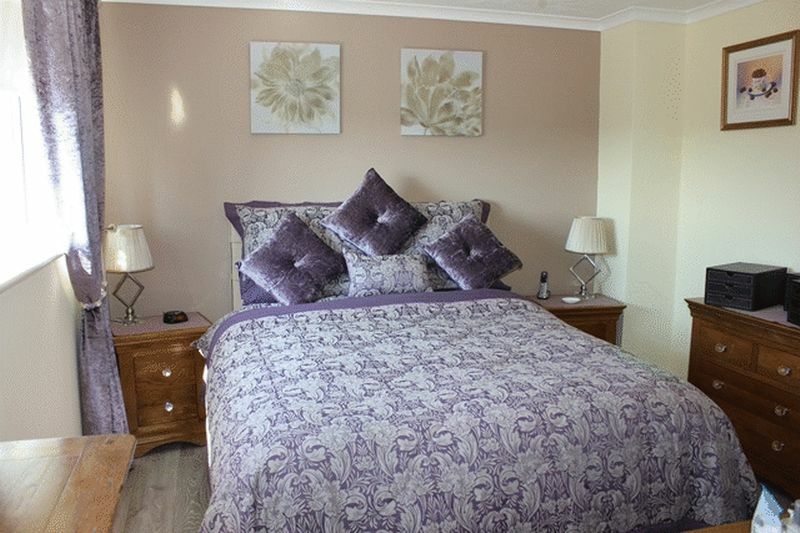 To the first floor are four bedrooms, all with fitted wardrobes, the master also having ensuite shower room, and further family bathroom. 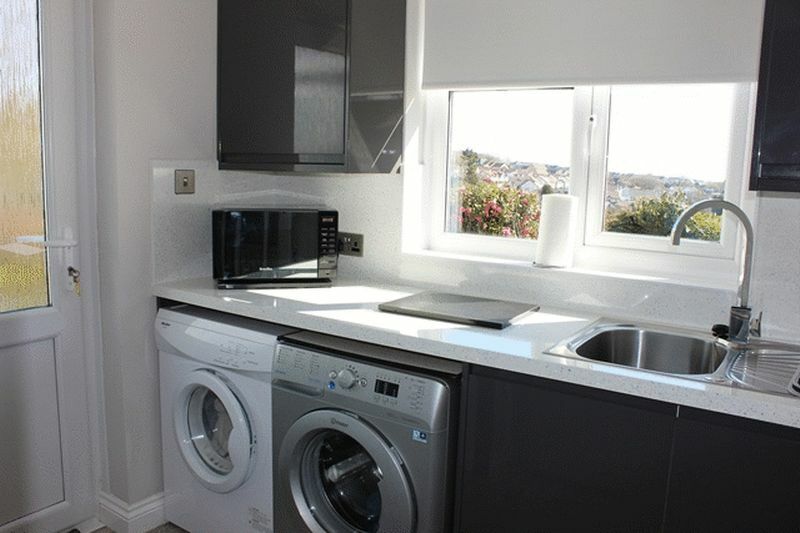 It also benefits from a gas-fired combination boiler and UPVC double glazing. This continues outside with UPVC soffits and fascia boards for ease of maintenance, along with the pebbledash rendering. 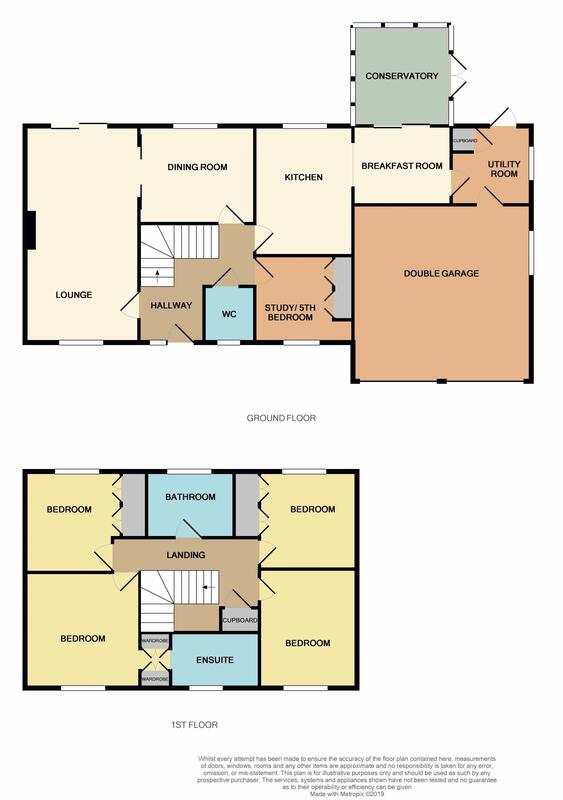 Outside there is immediate brick paved driveway/hardstanding parking which gains access to the double garage with paved pathway to front entrance with pillar feature. To the other side is a pathway leading around to the rear garden. 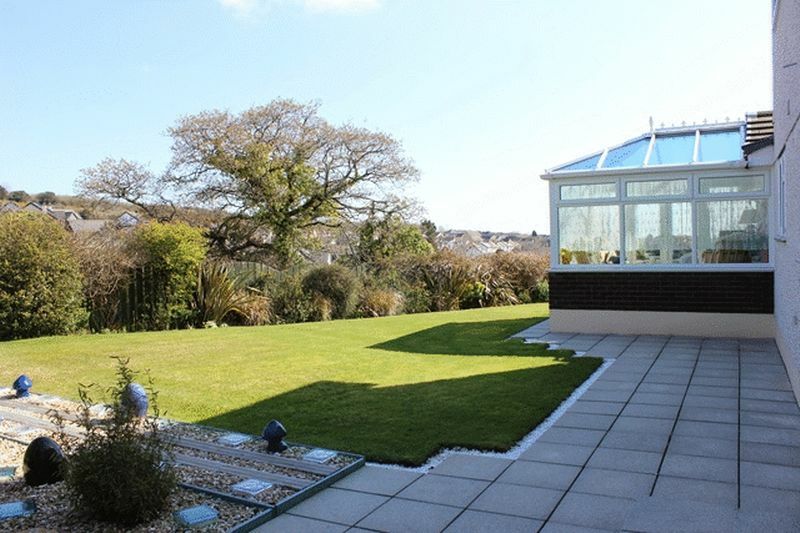 The rear garden is a real feature of this property, being of a good proportion and laid mainly to lawn with an elevated timber decked area taking full advantage of the distant coastal views. 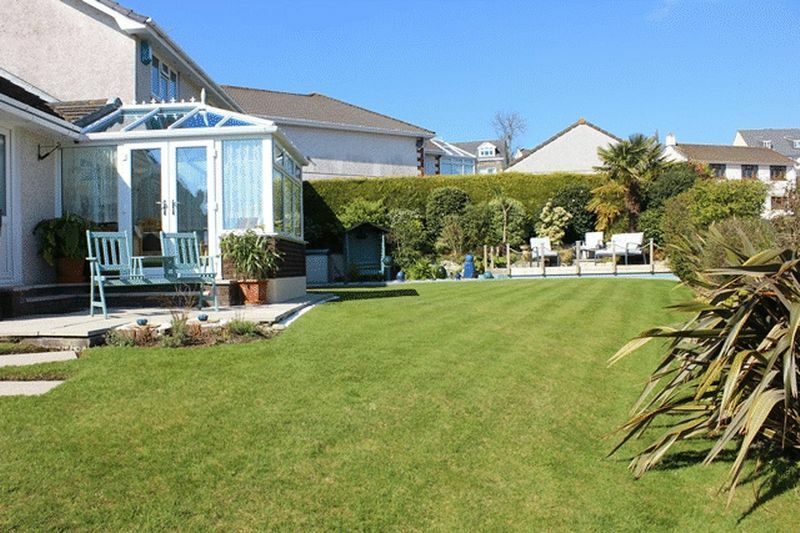 Jeryon Close is located within the Boscoppa area of St Austell which is a convenient setting for the family, being within walking distance of schools, college and a good range of amenities. St Austell's main town centre is just under a mile away. 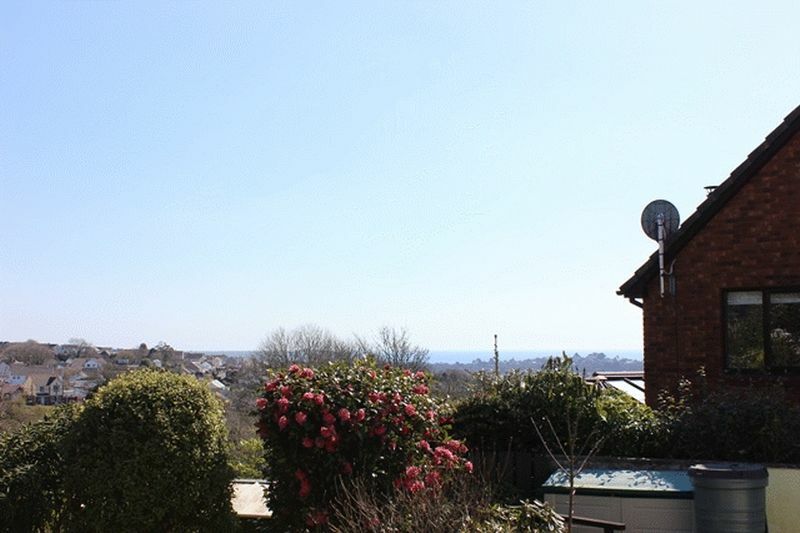 The whole cul-de-sac from this elevated position enjoys distant surrounding and coastal views. 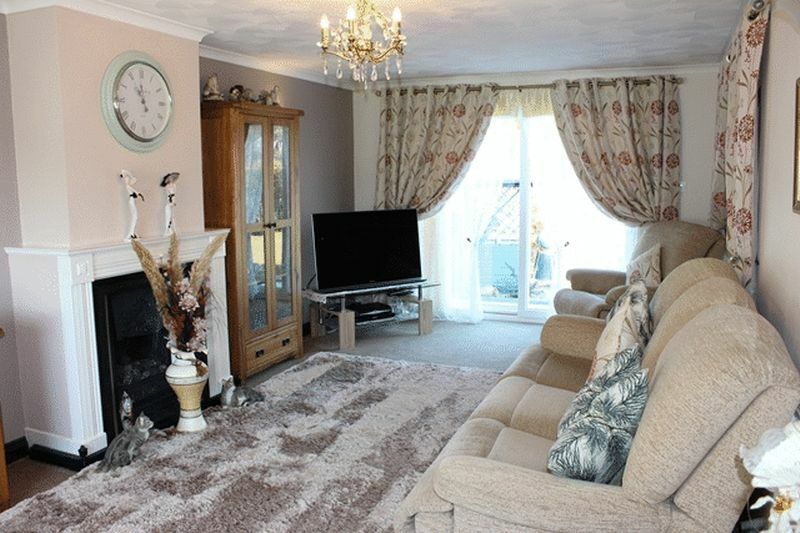 Combining this property's presentation, generous accommodation, gardens, parking and garage, it is anticipated to appeal to a good number of people and appointments to appraise internally are most strongly advised. Wide covered entrance porch approach, courtesy light, half glazed door to hallway. 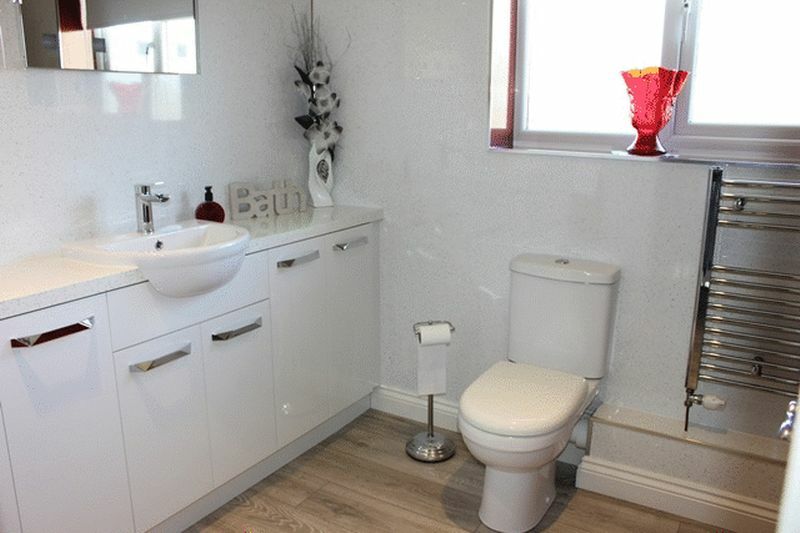 Generous reception area with stylish grey laminate flooring which continues throughout the majority of the living accommodation. 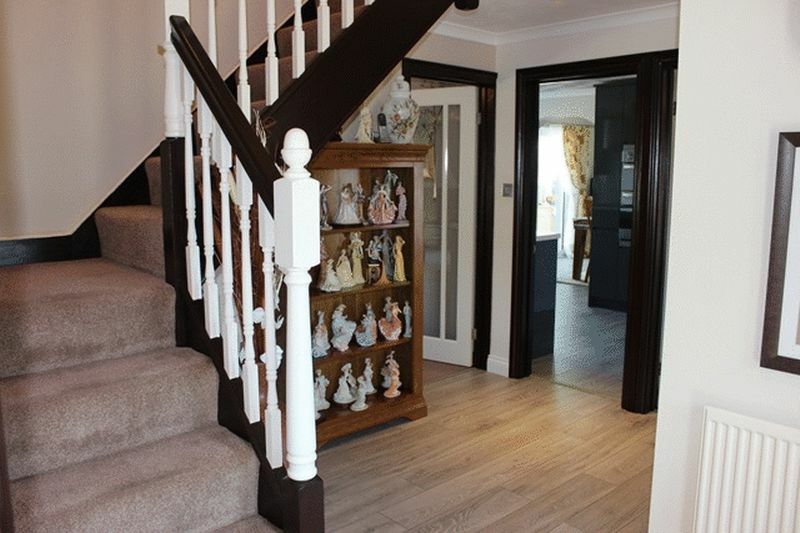 Turning staircase to first floor with attractive handrail banister and enclosed cupboard under stairs. Radiator. Door leading to cloakroom w.c., door to lounge, door to dining room, kitchen and study/fifth bedroom. 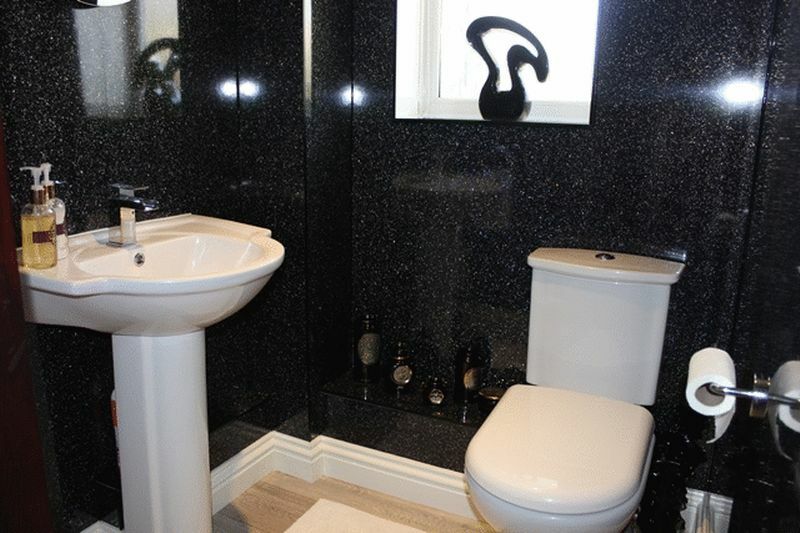 Recently refitted to incorporate pedestal wash hand basin and close coupled w.c. LED spotlight. 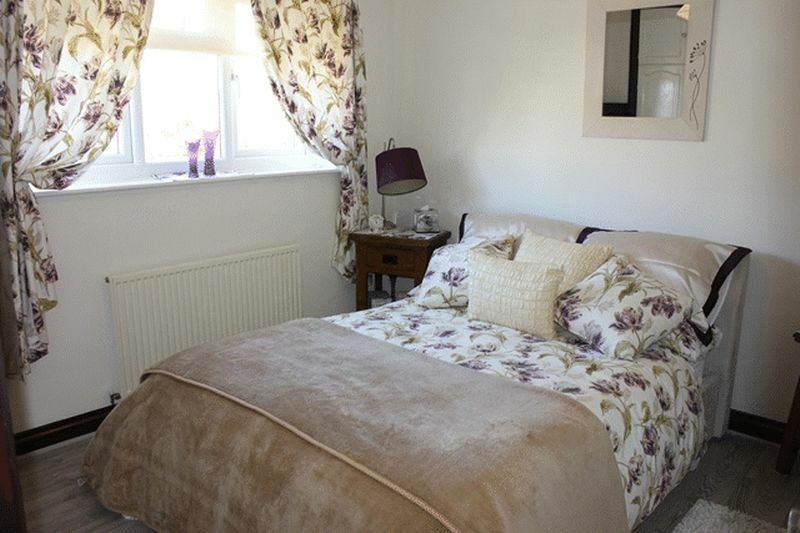 Attractive dual aspect room with picture window to front and patio doors to rear enjoying garden outlook. Chimney breast with timber mantel surround, fireplace housing living flame gas fire. Three wall lights. Radiator. TV aerial point. Sliding doors to dining room. 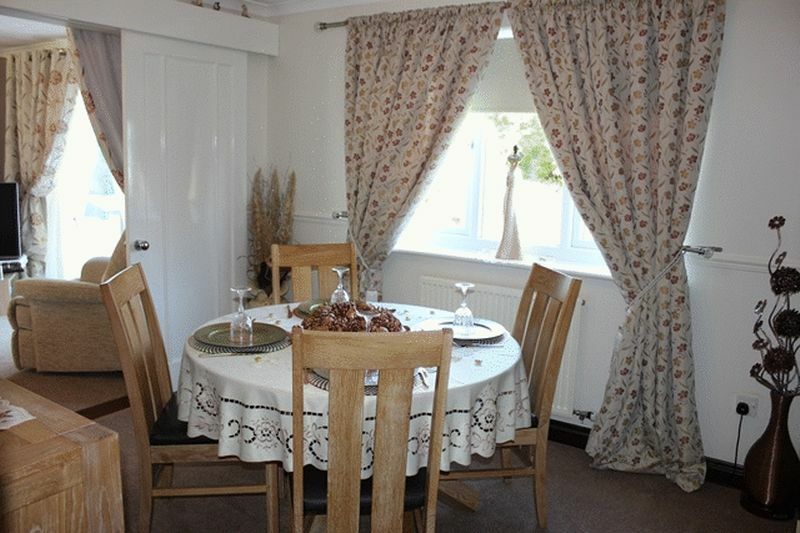 Practical separate dining area. Window to rear. Radiator. Door returning to hallway. 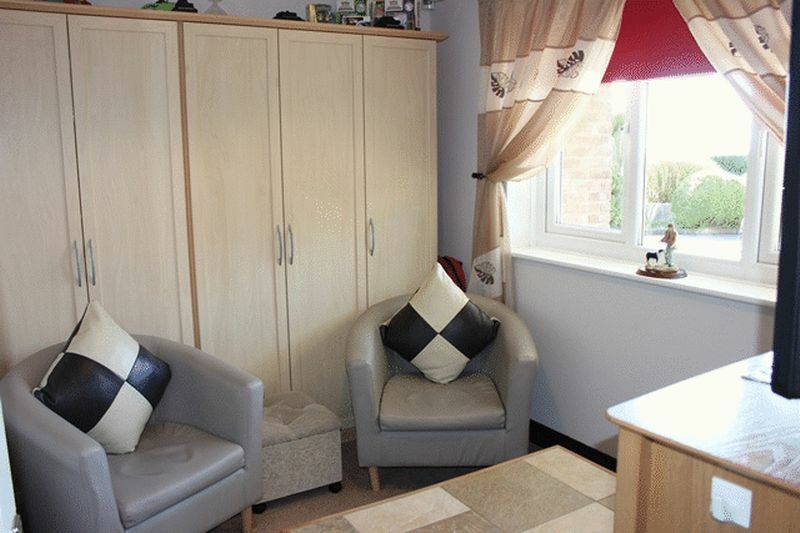 including fitted range of wardrobes/cupboard. Window to front. Radiator. Telephone socket. 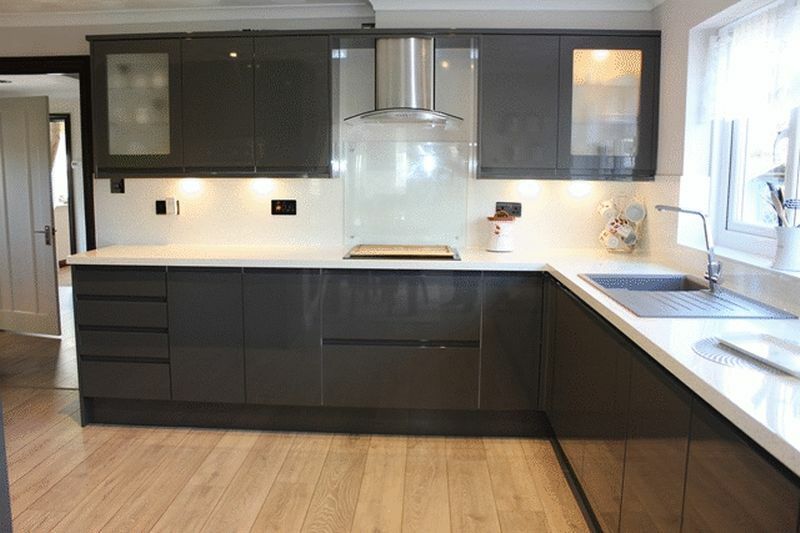 Fitted with a contemporary range of grey fronted base and wall units with working surface over housing inset sink unit. 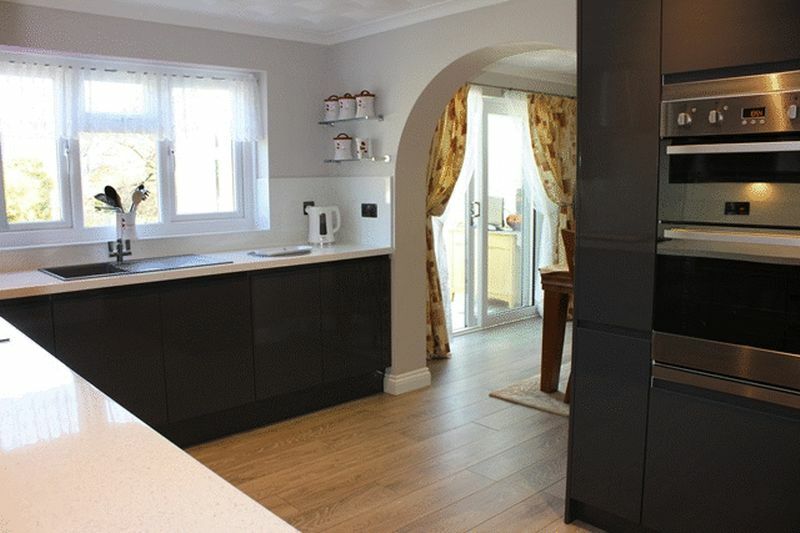 Matching splash back adjacent with eye level fitted oven. Window to rear. Opening to breakfast area. LED spotlights. Useful additional area. 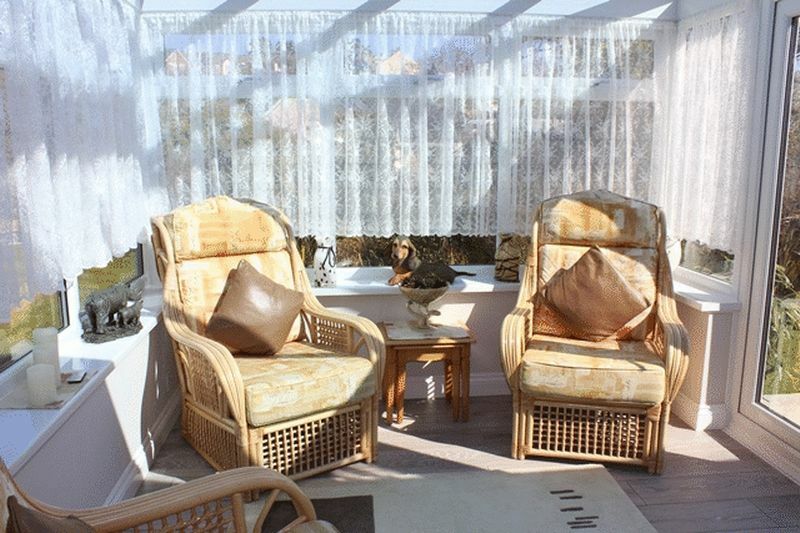 Sliding patio doors opening to conservatory. Door to utility room. Radiator. Telephone socket. TV aerial socket. 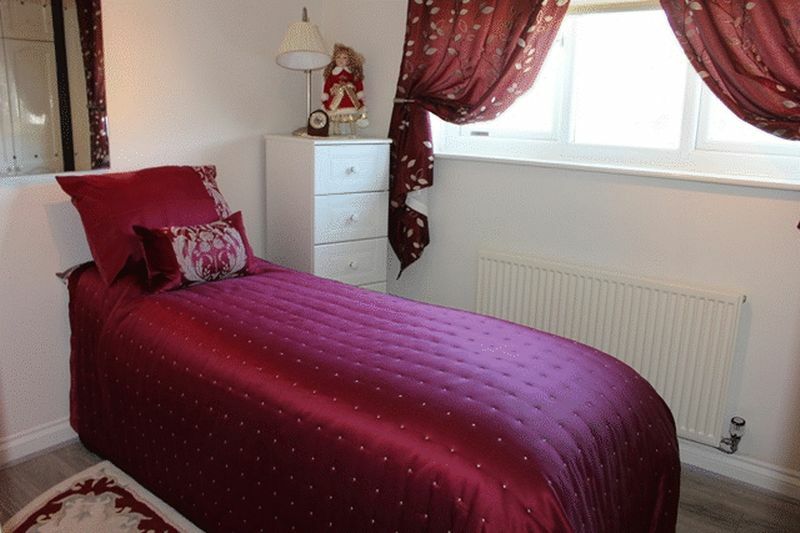 Delightful additional room enjoying garden outlook and surrounding rear garden and distant views. 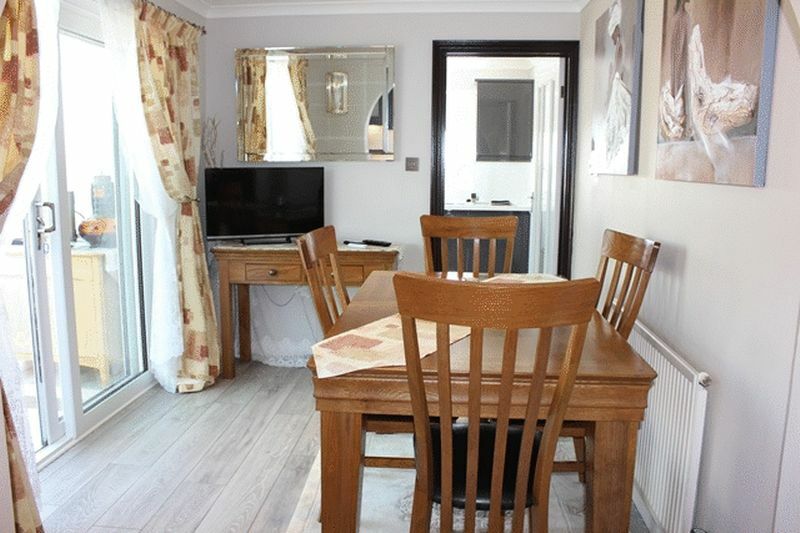 Patio door to side opening to garden. 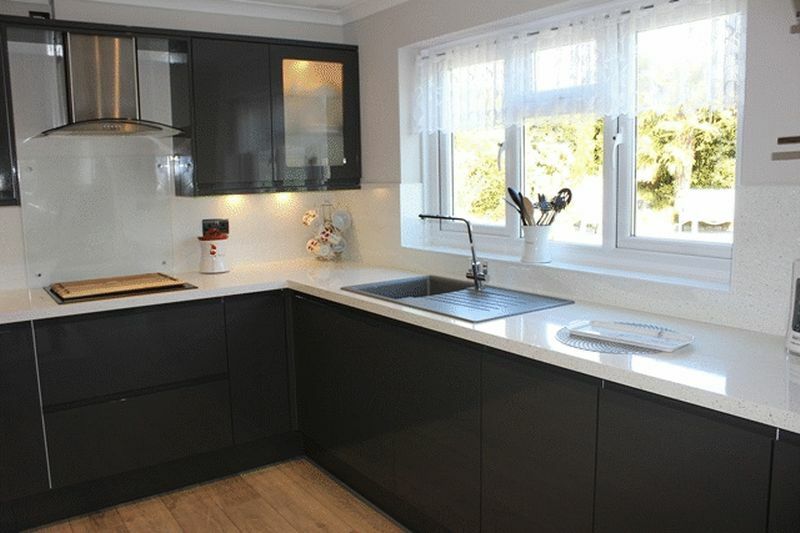 Built in range of matching base units to kitchen. Working surface over housing inset sink unit, space and plumbing for washing machine, further appliance space. Built in shelved pantry cupboard. Window to side. Pattern half glazed door to rear. Connecting door to integral garage. Fridge freezer space. 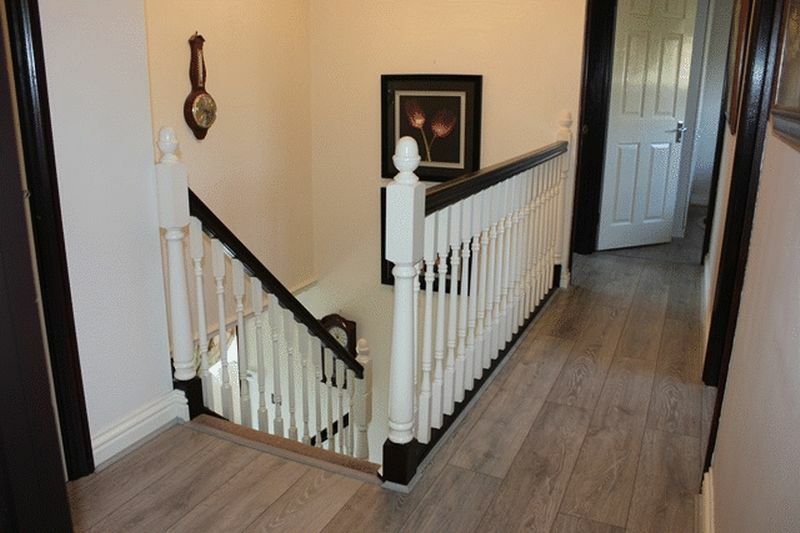 Attractive galleried landing with banister handrail to staircase reveal. Stylish grey laminate flooring continues into all four bedrooms. Shelved airing cupboard. Access hatch to roof space. Doors off to all four bedrooms and bathroom. Window to front. Radiator. TV aerial socket. Arch walk through to ensuite. Two recessed wardrobes providing shelved and hanging space. 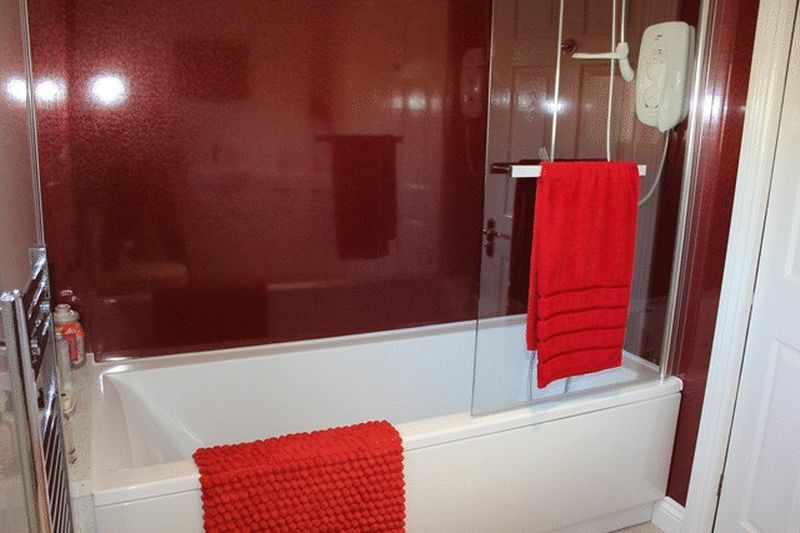 Recently replaced suite now provides wash basin with vanity cupboard under, shower cubicle, close coupled w.c., towel radiator. Inset ceiling LED spotlights. Extractor fan. Pattern glazed window to front. plus built in range of wardrobes. Window to front. Radiator. TV aerial point. Recessed range of wardrobes. Radiator. TV aerial socket. Window to rear. Recessed range of wardrobes. Window to rear. Radiator. TV aerial socket. 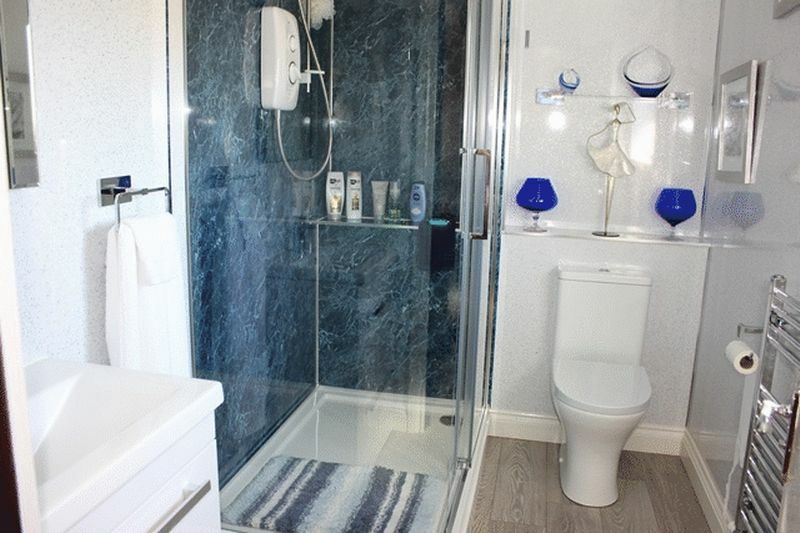 Spacious bathroom, recently refitted with a modern white suite providing bath with Mira electric shower over, wash basin with large vanity cupboard/storage, close coupled w.c., ladder style towel radiator. Extractor fan. Pattern glazed window to rear. 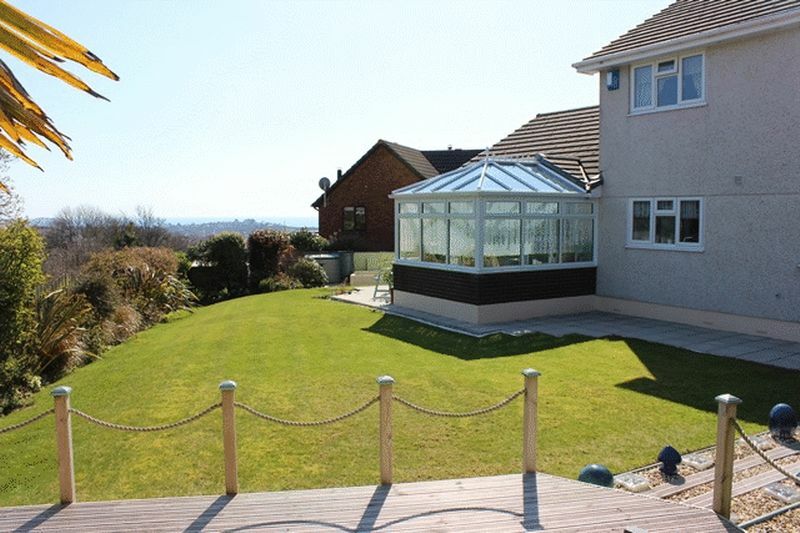 To the front is an expanse of lawn with paved front entrance pathway and pathways either side leading to the rear. 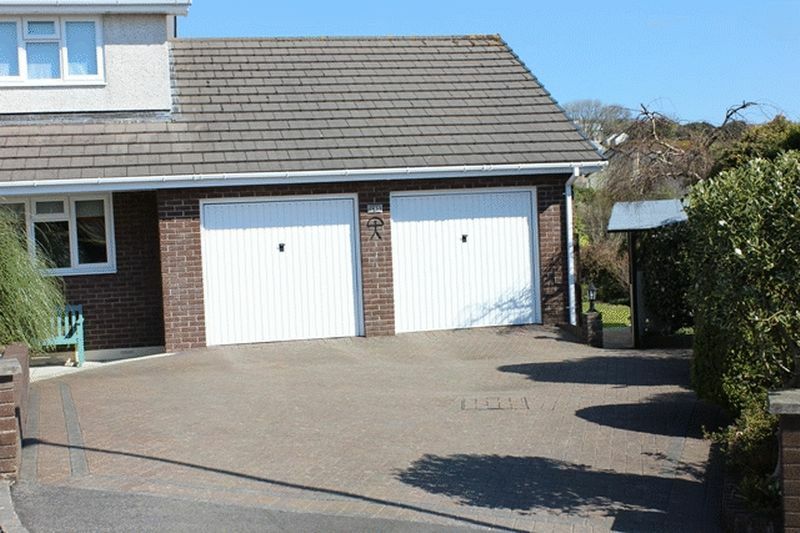 Brick paved driveway/hardstanding parking gains access to the integral double garage. The main gardens are to the rear which area well enclosed with fencing and hedging to boundaries. 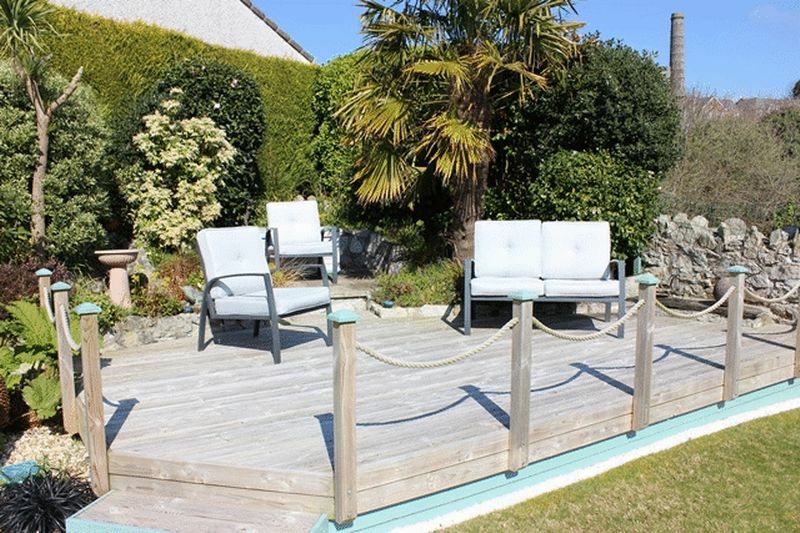 There is an immediate patio area leading on to a good expanse of lawn with well stocked shrub borders and feature raised timber decked area enjoying a sunny southerly aspect and taking full advantage of the surrounding and distant coastal views. Outside tap. Twin metal up and over doors. Good natural light via window to side. Built in range of base cupboards, wall mounted Ideal gas combination boiler. Access hatch to roof space with fitted loft ladder. Power connected. Telephone socket. 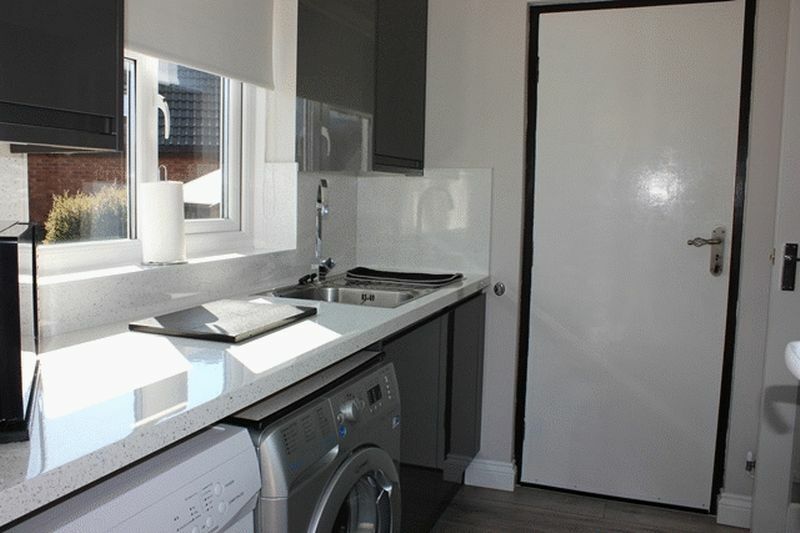 Personal door to utility room/main accommodation.